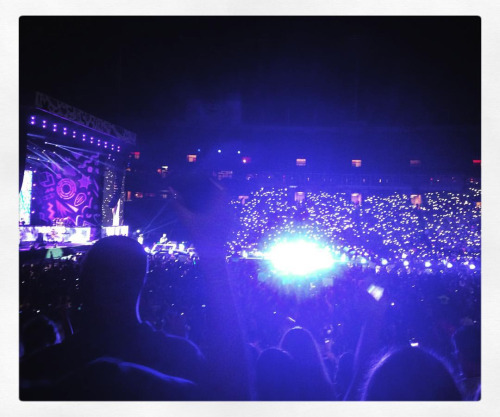 Sometimes inspiration strikes in the most unexpected places…like a One Direction Concert. I went to a One Direction concert last week, and it was one of the most inspiring things I’ve done in a long time. I know—it’s probably strange to hear a 27-year-old woman describe a boy band concert as “inspiring,” but my experience was less about what was happening onstage and more about what was happening in the crowd. Yes, those boys from Britain were quite charming and talented, and they put on a heck of a show. But for me as a woman interested in fandom and how we engage with the things we love, the best thing about that concert was watching the preteen and teenage girls around me scream, cry, dance, and hug their fellow fangirls through every song. Teenage girls can’t catch a break. They’re hardwired to care about things with a single-minded intensity that leads many to label them “crazy” or “silly” for feeling things as strongly as they do. And then when they take in what the world is saying about their impassioned reactions to things, they start to clamp down on their enthusiasm, and the world then labels them “vapid” or “shallow” because of how little they seem to care. It’s a vicious cycle designed to do nothing but make these girls feel bad about themselves. So it brought me immense joy to see thousands of girls and women unashamedly expressing the fullest extent of their enthusiasm last Thursday night at Ralph Wilson Stadium in Buffalo, New York, from the moment One Direction came onstage until long after the last encore had finished. I’ve seen that stadium filled with Buffalo Bills fans on Sunday afternoons for years, and this was no different—thousands of people joining together to cheer and share their excitement over something they love. People just want to make it something different because sports fandom is generally the realm of adult men, while boy band fandom is the realm of young women. And it doesn’t take a genius to figure out which group of not-so-different fans gets more respect from the world at large. It was nice—for one night at least—to watch young women express whatever emotions they were feeling in the moment without having to explain them, apologize for them, or feel self-conscious for feeling as strongly as they do about things. And it was because they knew they weren’t alone. They were surrounded by other young women who were feeling those same feelings just as strongly as they were. They had hands to hold while they jumped up and down, people to dance with, and friends (new and old) to hug as they shared their overwhelming joy. That’s what fandom is all about. At its core, being a fan of something is about joy. Being a fan of something should make you happy. And fandom should be about sharing that happiness and excitement with others. All too often, fandom becomes a place of negativity, stress, and anger. But those teenage girls I saw last week had it right: Fandom should be a safe place to express enthusiasm and other positive emotions about things you enjoy. You’re not always going to love everything that happens in your particular fandom, and that’s normal. But being a part of a fandom should make you happy more often than it makes you upset. When the balance shifts the other way, maybe that’s the time to find a new fandom to focus on. Enthusiasm should be protected, especially in young fangirls. Because I’m always amazed by the things young fangirls can do when they put their minds and hearts into something. When celebrities talk about charity efforts or start important initiatives, young fangirls are often on the ground floor—spreading the word, donating their babysitting money, or creating art or fan fiction for donations. That’s why encouraging young fangirls to hold on to their ability to care is so important. As they grow, they might not always love One Direction or Once Upon a Time or John Green novels the way they do now. But the ability to care they developed during their times in those fandoms can be channeled into amazing avenues—from incredible novels written by women who wrote fan fiction in their youth to charitable organizations started by women who learned to work together as members of fandoms. Teenage girls have a spark inside of them that can change the world, and it’s so important to me to keep that spark alive in a world that tries to get them to turn down that flame. If you’re a teenage girl reading this, please don’t ever stop caring about the things you love with the intensity you feel right now. It’s beautiful, and it’s inspiring. And it’s something that those of us who haven’t been teenage girls in a long time should be doing all we can to protect and rekindle in our own fangirl hearts. This entry was posted in General and tagged essays, music, nerd musings by Katie. Bookmark the permalink. Katie, thank you so much for writing this post!! It means a lot to read about someone in fandom acknowledging the contributions of teenage girls. It was such a joy for me to write this post, Abby, so I’m happy you liked it! Teenage girls aren’t respected enough for what they contribute to fandom, so I’ve wanted to write about why they deserve more respect for a long time. I’m glad I found the inspiration to do it! I just want to quote this whole thing and yell about how much I love it. But I will resist. It’s been another one of those weekends where I am in awe of what young fans can accomplish. Patrick Ness’s (and the many other wonderful YA authors who contributed) charity drive for Save the Children has blown me away. It’s HARD to get people to donate to things. I see my office struggle to convince people to give even a small amount back to their university and I’ve been the person reluctant to give in the past. I don’t want to discount the effect that the matching funds donated by the authors and publishing houses have had on the total they’ve raised, but it means each of those £10,000 that people are matching is largely coming from non-celebrity indivduals. And given the demographic reading Patrick Ness, John Green, Maureen Johnson and Phillip Pullman, most of those contributions are coming in from young fangirls. It’s fangirls who are hearing about the drive as authors tweet and their friends retweet them. They are spending their money to make a difference. Celebrities are instilling an understanding of philanthropy in their fans and that’s something that will only continue to make a difference as these girls age. All of the numerous fundraising drives I’ve seen and taken part in over the years have largely been done by young fangirls. And when they can’t donate, they make things and other people donate on their behalf. And the longer I work in philanthropy, the more amazed I am in what they are able to achieve. I really loved this part. I will love the Backstreet Boys forever because of what they represent to me, but I’m no longer the fangirl I was for them as a teenager. I look back on all that passion with a lot of fondness and I’m glad it was an experience I had. Reclaiming some of my love for them as I came out of my need to distance myself from my enjoyment of them because it was uncool was a big point in my life and it’s one that has lead back to a very enjoyable life as an older fangirl. I’m glad that teenage girls still get excited over boybands and that their concerts are still a magical experience for them. They are really the heart of fandom because most of the women that participate now were once those teenage girls. It’s shaped many of us into the people we are today and that passion should always be encouraged and appreciated. I love getting your perspective on this because of your job working with fundraising. It continually amazes me that teenage girls are able to raise the kind of money they do for important causes, and I wish more people would take that power and passion more seriously. They want to make the world a better place, and all they need is the right channel and right inspiration to do it. I’m so glad that celebrities are giving them those channels. I also loved what you said about teenage girls being the heart of fandom. So many of the fangirls I know today grew up as teenage boy band fans, and those fandom experiences taught us to love things with our whole hearts and to let ourselves experience excitement and joy as fully as humanly possible. It brought me no end of happiness last week to see a new generation of young fangirls living out those same feelings.